This is a heavily disturbed area of Sydney. All previous native vegetation was removed from the area that now marks the area of Carmichael Park. 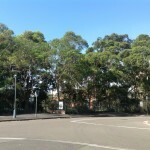 Following the decline of industrial uses in the area and the re-introduction of residential living to the Pyrmont Peninsula this former industrial and quarry site has been set aside as a reserve. 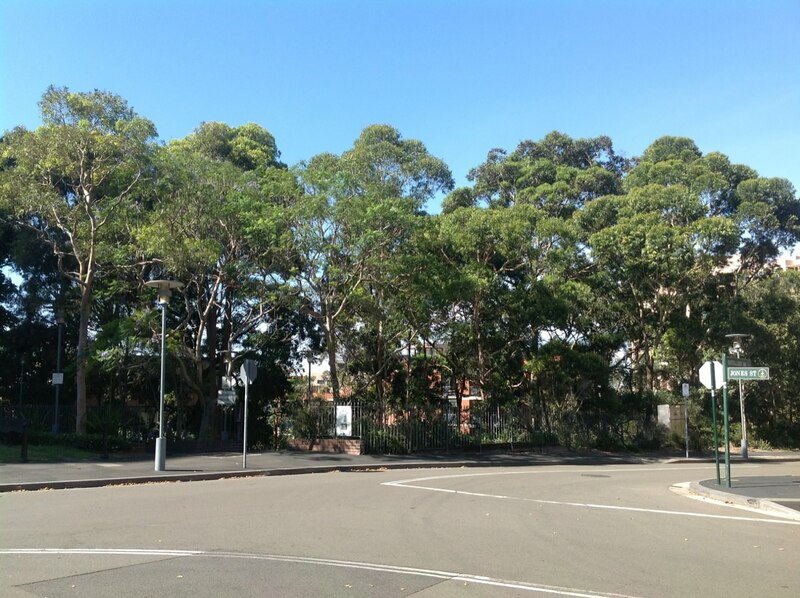 It has been progressively planted since the 1980’s in a naturalistic style, similar to other sandstone escarpment sites around the inner Sydney Harbour suburbs. The site is dominated by a large level change between John Street in the north and Quarry Master Drive to the south. 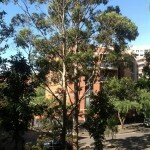 It is now a pocket of semi-naturalistic vegetation within the heavily urbanised and disturbed areas of Pyrmont. 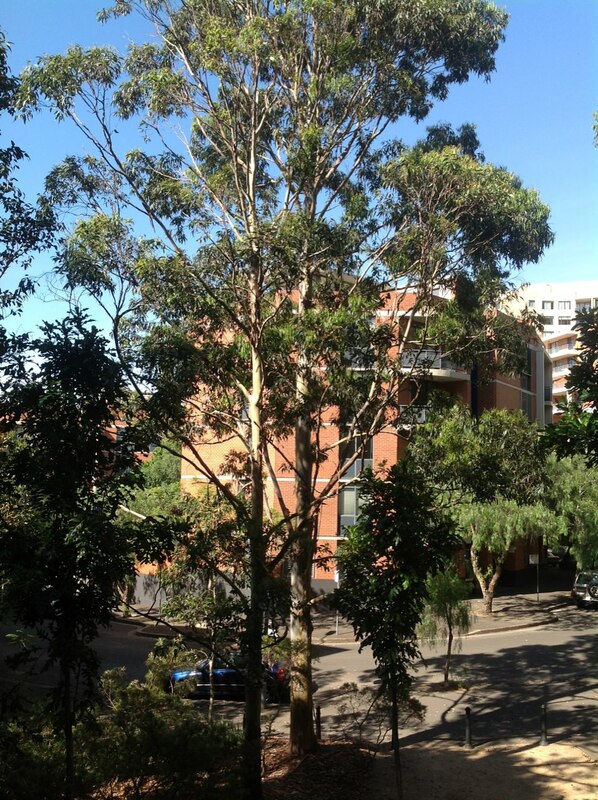 There are several large native trees endemic to the Sydney region and would have been found on or near the Pyrmont area naturally, pre-European settlement. Only the larger tree specimens have been scheduled in the Register. Numerous smaller and successive planting using the same species has been undertaken and occur within the reserve, however these are not considered significant in terms of the Register at this time. 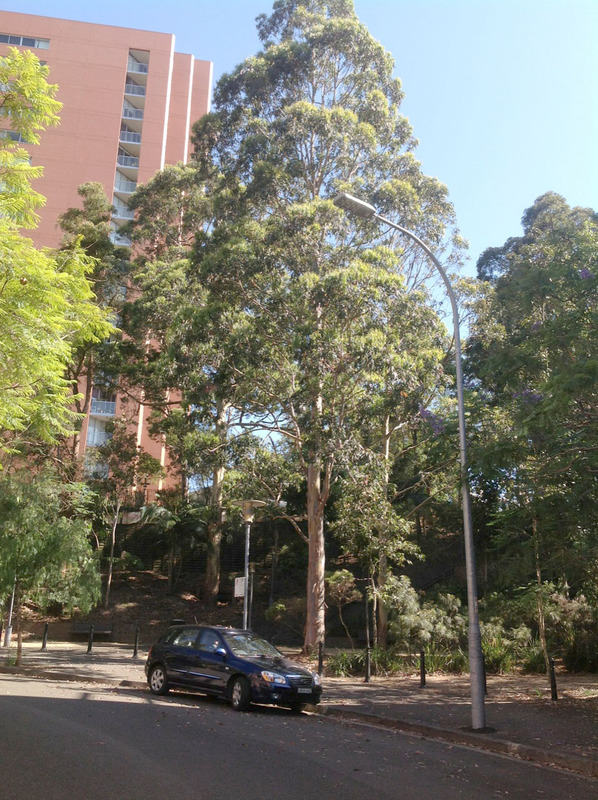 A particularly large Sydney Blue Gum (Eucalyptus saligna), of impressive dimension, dominates the centre of the park at approximately 22m in height with a spread of 18m and a trunk diameter of 0.9m at 1.4m above ground level. A further two specimens are located nearby but are of smaller stature. The other scheduled items include four Smooth-barked Apple (Angophora costata), four Blackbutt (Eucalyptus pilularis), two Spotted Gum (Corymbia maculata), one Red Bloodwood (Corymbia gummifera) and one Bangalay (Eucalyptus botryoides). A single Red Cedar (Toona ciliata) occurs at the base of a large sandstone cliff to the eastern end of the reserve near the light rail cutting. Although unlikely to have occurred naturally around Sydney Harbour it is a relatively unique species within the Sydney area and is naturally found in rainforests and closed forests north and south of Sydney. It was a highly sort after timber and has been extensively cleared by timbergetters in the nineteenth century. There are a number of other supporting components including some large Tallowood (Eucalyptus microcorys), Brush Box (Lophostemon confertus) and Queensland Firewheel Tree (Stenocarpus sinuatus). These are native to regions north of Sydney and are therefore not considered as significant, although they still contribute to the park’s native character. Numerous specimens of the native Bangalow Palms (Archontophoenix cunninghaminana) also grace the reserve and support the diverse native character of the park and the other native understorey shrubs and groundcovers. 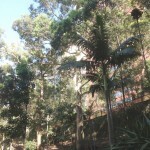 Although the tree planting is not historically significant, this previously heavily disturbed and altered landscape has been intensively planted and landscaped since the 1980’s to recreate a semi-naturalistic vegetation community, reflective of the Sydney bushland that would have once covered the Pyrmont peninsula. Recent years have seen an increase in community interest and the use of species that are endemic to the area. 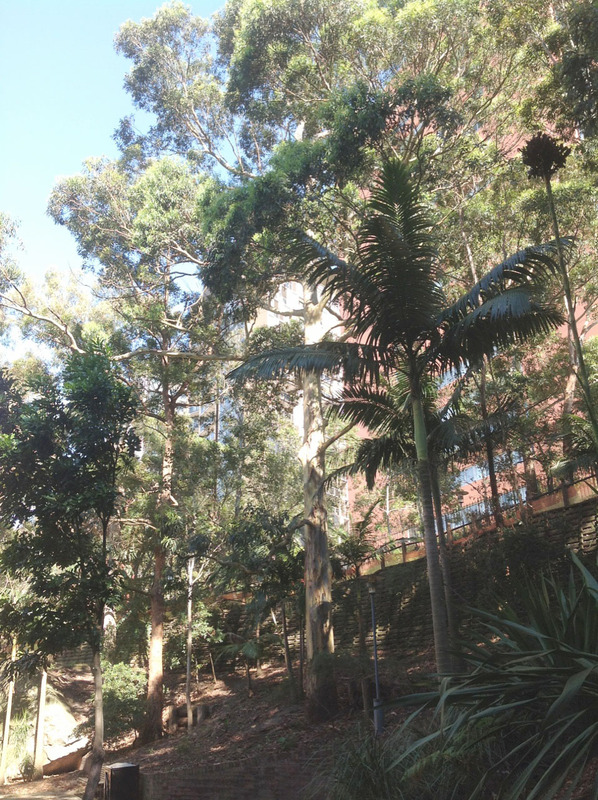 The larger locally indigenous trees planted within the reserve have group significance at the local level for their contribution to biodiversity, local wildlife and ecology and provide an important symbolic connection to the vegetation that would have once graced the Sydney Harbour foreshores. This is relatively rare within the LGA, particularly in public areas and in such a naturalistic fashion. Some of the trees have also reached substantial proportions and will continue to reach even larger sizes and are therefore also considered visually significant in the local context. In 1853 Charles Saunders purchased land from the Harris family for a sandstone quarry on the northwest side of the peninsula. This developed into a substantial operation including a causeway to Darling Island and some of Sydney’s most reputable and well-known buildings were built using Pyrmont’s yellow block sandstone, including Sydney Town Hall, the Art Gallery of NSW and the University of Sydney, the University of Sydney, Colonial Secretary’s Building, Lands Department, General Post Office, and other buildings in Melbourne, New Zealand, Fiji and Canada. The quarry on, and near, the site of Carmichaels Park was established in 1853 by the Saunders family. The quarries employed over 300 men in the late nineteenth century. Pyrmont was the home of Sydney’s best sandstone, creating a highly profitable quarrying business. The site of the quarry is listed as heritage item in the City of Sydney Local Environmental Plan 2012. By the early 1980’s most of the industrial uses and freight services had been moved elsewhere and the railway goods yard closed. Even though Darling Harbour was officially opened as an entertainment and leisure centre in 1988, Pyrmont was largely derelict, with its thriving population of thousands reduced to a mere 900 by 1990. Today, Pyrmont is a lively mixture of industry, small businesses and residential areas. An initiative by the government called the ‘Better Cities Programme’ led to great improvements within the suburb, attracting a wide variety of new residential apartment development and establishing a pleasant, village-style atmosphere. Aerial photos of the area show the extensive modification of the site and the area dominated by industrial pursuits. There was no native or planted vegetation within Carmichael Park at this time. The Park is believed to have been developed during the 1980’s when the area of Quarry Master Drive was redeveloped as mixed-use apartments and commercial enterprises. During this time the planting of native trees and shrubs was popular and a diverse and mixed palette of species was planted to embellish the park. 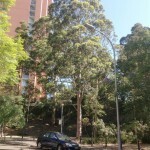 Over the subsequent decades, increasing community interest has been developed in the Pyrmont area to restore the endemic vegetation of the area. This has lead to the park area being well maintained and successive layers of increasingly endemic species being planted in the park.